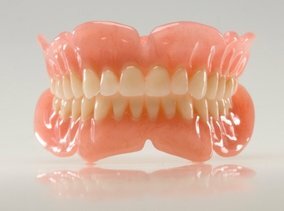 What are titanium reinforced complete dentures? • Immediate Full Dentures - Prior to having your teeth removed, your dentist takes measurements and has dentures fitted for your mouth. After removing the teeth, the dentures are immediately placed in your mouth. The benefit is that you do not have to spend any time without teeth. You will, however, need to have a follow up visit to refit your dentures because the jaw bone will slightly change shape as your mouth heels. The dentures will need to be tightened after the jaw bone has healed. Partial dentures are another option when not all of your teeth need to be removed. This is similar to a bridge, but it is not a permanent fixture in your mouth. After delivery, your dentures may take some time to get used to. In delivery, the flesh colored base of the dentures is placed over your gums. Some people say that it feels bulky or that they don't have enough room for their tongue, and other times the dentures might feel loose. These feelings will affect the way you eat and talk for a little while, but over time, your mouth becomes trained to eat and speak with your dentures and they begin to feel more and more like your natural teeth. They may never feel perfectly comfortable, but it is much better than the alternative of not having teeth. What should I do after denture delivery? What is a titanium palate and why is it used? (1) Titanium is almost 4X thinner than acrylic in the palate area, providing additional room and freedom for your tongue movements during speech and eating. (2) Titanium will allow you to sense the temperature (hot/cold) of the food you eat and beverages you consume because it conducts temperature unlike pink acrylic. (3) A Titanium palate will make your upper denture lighter and therefore less likely to dislodge. (4) Titanium will render your upper denture almost fracture proof (excludes teeth of course).